I don’t know why I am not a fan of stuffed vegetables, it is something I quite never had a great pleasure eating and I really cannot understand why. Maybe because they remind me of my childhood: the stuffed vegetables my aunt was preparing in Italy, they were so greasy and floating on oil, that I could not eat them…and of course, I had absolutely no other option than eat them, because she would not let me go. I would elbow my mom so she could take them discreetly in her plate, but of course, that was not an option either since zia Flora was scrutinizing us. Now, zia Flora has no internet and does not speak English, so she will never know I hate her stuffed eggplants! In France we have an expression that says “marche ou crève” meaning “walk or die”, in Italy it would be more like “mange ou crève” which means “eat or die”!! Anytime I make stuffed vegetables, I just cannot avoid thinking about those beautiful purple eggplant soaked in oil. Not sure why some of the older generation of people think that if there is little fat, there is no taste, that somehow fat and taste are related. Where does this come from? Obviously you need fat, I don’t like anything “fat-free”, and never buy those fat-free products but you just cannot use half liter of oil anytime you make a meal. Those zucchini are different, they are fulfilling but light and certainly not greasy. I used little millet and actually I was quite happy about the result, so I figured I would post it, for those of you who want an idea for stuffing veggies. I know millet is mainly a bird seed but I somehow like its taste and nutritious values, since they are filled with proteins. First start cooking millet. You can either use a rice cooker, or steam millet in twice its quantity of water until it’s soft and the seed has popped out. Cut the zucchini lenghtwise, scoop the flesh with a teaspoon, cut in small pieces. Heat olive oil in a pan, add shallots, and cook until soft, then add garlic and cook for another minute or less. Add the diced zucchini flesh and cook until soft. In a container, mix zucchini, shallot mixture, add tomatoes and the rest of the ingredients and the cooked millet. Mix well and stuff the zucchini with the mixture. Cover with aluminum foil and cook in a 375F oven for about 20 minutes, then remove foil and cook for additional 10 minutes to brown the top. This entry was posted by silvia on June 17, 2009 at 8:05 pm, and is filed under Grains, Side Dish, Vegetables. Follow any responses to this post through RSS 2.0.You can leave a response or trackback from your own site. I love stuffed vegetables but only once in a while, I’d have to be in the mood for it. 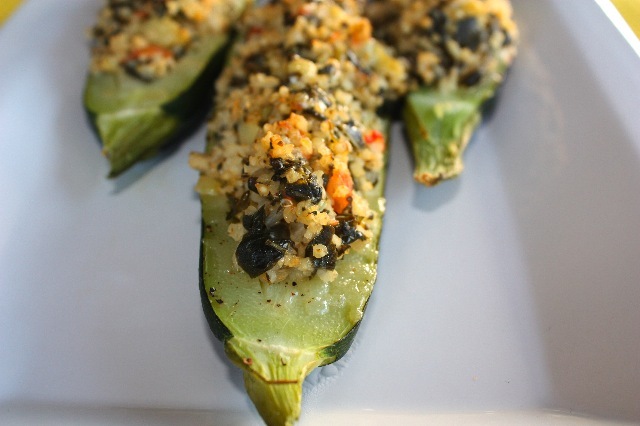 Those stuffed zucchini however looks really appetizing and I would love to have some of that. Beautiful — and I love how the first photo looks like a little fleet of zucchini boats heading straight towards a hungry tummy! What a great recipe. 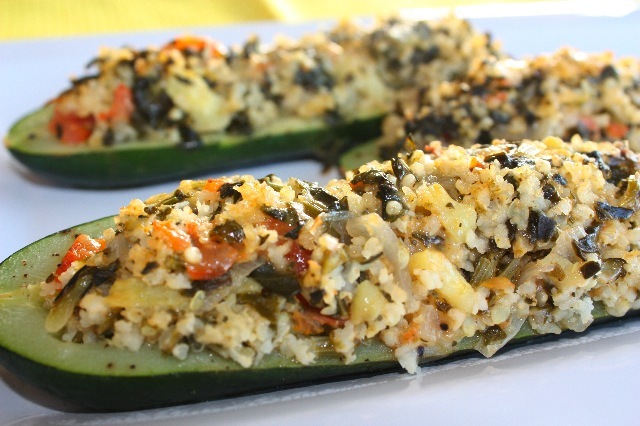 I love using zucchini since it’s got such a delicate flavor and holds up so well under heat! I usually don’t think to make stuffed veggies but this recipe looks great. I like that you are using millet in this. These zucchini are beautiful. And I so agree with your “fat philosophy.” I don’t like fat-free products either, but huge amounts of fat certainly do not equate taste. There are so many ways to add flavor without adding lots of fat. Great dish!